CCOA has a new priest! Fr. Ron was ordained on August 5, 2017 in Las Cruces, New Mexico. 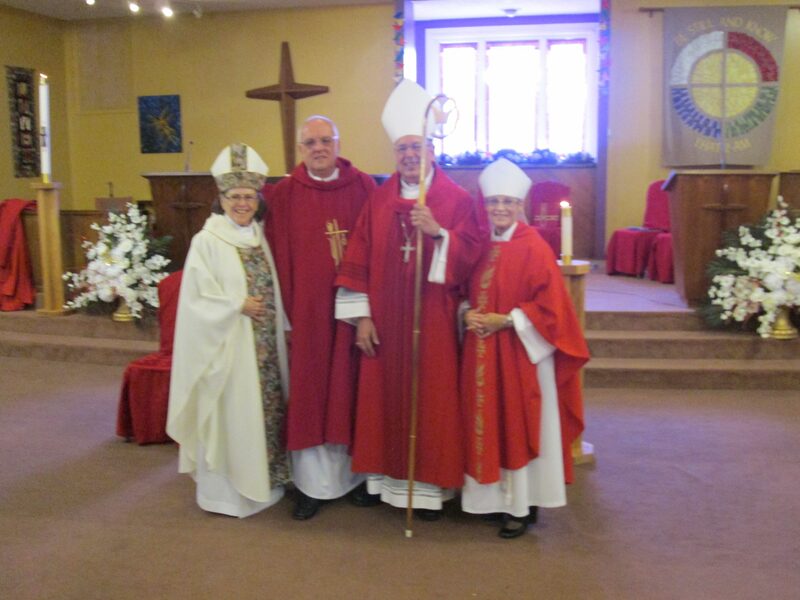 He is pictured here with Bishop Diana, Presiding Bishop Mark and Bishop Linda, Dean of Sophia Divinity School. May you have a joyful celebration of Pentecost, not only on Pentecost Sunday, but also every day of your life! We bid farewell to Reverend Patricia Galileo, 1941-2017, who served the Catholic Apostolic Church of Antioch as priest and archpriest from 2000 until her move to Honolulu in 2015. Mtr. Pat was ordained in the American Catholic Church in May of 2000. In December of that same year, Pat+ was received into the Catholic Church of Antioch. Most recently, Pat+ was living in Honolulu and was one of the occasional presiders for Dignity/Honolulu. Presiding Bishop Mark Elliott Newman and Bishop Linda Rounds-Nichols are participating in the Spiritual Director’s International Conference in Toronto. If you are here as well, we’d love to meet you! Although Easter Sunday is almost over, the Easter season continues for the next 50 days. I wish you a very blessed and uplifting Eastertide. May the joy of the Resurrection be your constant companion in the days ahead. In truth He has risen! May you have a spirit-filled week! This is the most important week in the Christian year, beginning with Palm Sunday, moving toward Maundy Thursday, Good Friday, and the Vigil on Holy Saturday, all leading us to the celebration of Easter on Sunday. Scott+ completed one last outstanding item and received his BDiv this weekend. Fr. Joshua, 1941 – 2017, was a CCOA priest, a spiritual healer, and a Filipino Psychic Surgeon. He traveled extensively for the past three decades, offering workshops, healing services and individual healing sessions. He believed that healing comes through the power of prayer, forgiveness, and the Holy Spirit. The latest edition of our newsletter is available. Please take a look! You’ll find it on our newsletters page. Many blessings for the year ahead ~Happy New Year!